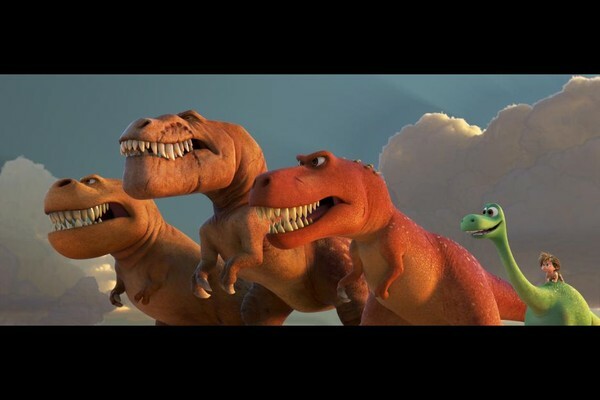 The Good Dinosaur imagines a world where dinosaurs didn’t become extinct. Unfortunately, the resulting butterfly effect produces an alternate Pixar Animation Studios that makes lazy, unoriginal movies. After reclaiming its reputation with Inside Out earlier this year, this is arguably Pixar’s poorest production to date. The film conceives a backstory in which the asteroid that wiped out the dinos veers away from Earth. Rather than merely lending dinosaurs anthropomorphic features (as Pixar has done with nonhuman protagonists in nearly all their animated films), here they evolve over millions of years into English-speaking frontiersman. Poppa Henry (voiced by Jeffrey Wright) and Momma Ida (Frances McDormand) are rearing three apatosaurus kids to eventually take over the family farm. However, Arlo (Raymond Ochoa), their youngest, is kind-hearted but weak and fearful. Henry tasks Arlo with killing the critter stealing their winter corn in order to earn his familial bona fides. But as Henry and Arlo track the culprit, a snarling prehistoric caveboy, Henry is swept away and killed by a flash flood. When Arlo next chases the caveboy, it also ends with Arlos being carried away by raging rapids and deposited far from home. Arlo and the feral Neanderthal boy, who Arlo names Spot, join together to traverse treacherous terrain and find their way home. The Good Dinosaur quickly transitions into Cormac McCarthy’s The Road, if re-imagined by a focus group of fourth graders. Arlo and Spot—seemingly patterned after Chris Kattan’s old Mr. Peepers character from “Saturday Night Live”—encounter a surreal setting that includes a disturbingly dimwitted styracosaurus and psychotic, predatory pterodactylus. For some reason, this dino evolution mirrors human culture, so we also have an American West complete with redneck dialect spouted by yokels with names like Bubbha and Lurleane. Arlo and Spot join up with a trio of T. rex ranchers (including one voiced by Sam Elliott, natch) to thwart a herd of velociraptor rustlers. Cue the fiddle and harmonica. The lurching mood fluctuates from syrupy to trippy to dark. Likewise, gorgeous animated renderings of the high Sierra landscape contrast with the reductive representation of Arlo’s Dino the Dinosaur look. Characters intone feel-good bromides like, “Sometimes you gotta get through your fear to see the beauty on the other side.” Huh? Initial production on The Good Dinosaur began in 2009, and this final product betrays the project’s troubled history, which includes several changes of director, writer and cast. What’s left is sweet but boring, a film that’s visually stimulating but thematically slight. In other words, it’s more Disney than Pixar, resulting in the latter’s first mediocre effort (yes, even worse than Cars 2). That said, it’s almost worth enduring the rest of the film just to hear Sam Elliott growl, “If you ain’t afraid of a crock biting you on the face, then you’re not alive.” Almost.